After you have created a SharePoint site, you may want to provide or restrict user access to the site or its contents. For example, you might want to provide access only to members of your team, or you might want to provide access to everyone, but restrict editing for some. The easiest way to work with permissions is to use the default groups and permissions levels provided, which cover most common scenarios. But, if you need to, you can set more fine-grained permissions beyond the default levels. 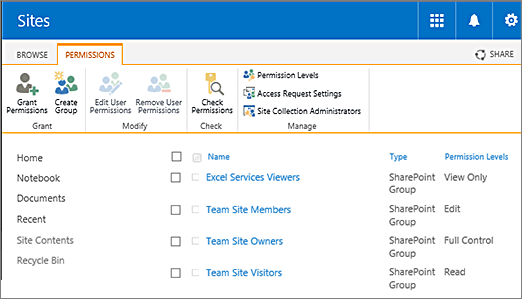 This article describes the different permissions and permission levels, how SharePoint groups and permissions work together, and how permissions cascade through a site collection. Want to go straight to the steps for changing or setting permission levels? See How to create and edit Permission Levels. If you work on a site, you are working inside a site collection. Every site exists in a site collection, which is a group of sites under a single top-level site. The top-level site is called the root site of the site collection. 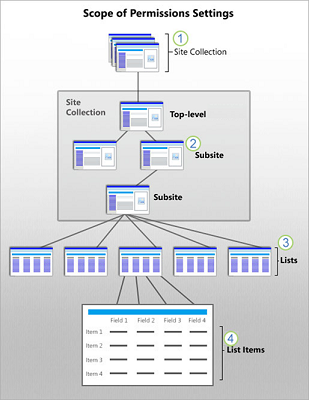 The following illustration of a site collection shows a simple hierarchy of sites, lists and list items. The permissions scopes are numbered, starting at the broadest level at which permissions can be set, and ending at the narrowest level (a single item in a list). A site collection administrator configures permissions for the top level site or root site for the whole collection. If you are a site owner, you can change permission settings for the site, which stops permission inheritance for the site. Lists and libraries inherit permissions from the site to which they belong. If you are a site owner, you can stop permissions inheritance and change the permission settings for the list or library. List items and library files inherit permissions from their parent list or library. If you have control of a list or library, you can stop permissions inheritance and change permissions settings directly on a specific item. It is important to know that a user can interrupt the default permission inheritance for a list or library item by sharing a document or item with someone who does not have access. In that case, SharePoint automatically stops inheritance on the document. Default permission levels allow you to quickly and easily provide common levels of permissions for one user or groups of users. You can make changes to any of the default permissions levels, except Full Control and Limited Access, both of which are described more fully in the table below. Contains all available SharePoint permissions. By default, this permission level is assigned to the Owners group. It can't be customized or deleted. View pages and items in existing lists and document libraries and download documents. Enables a user or group to browse to a site page or library to access a specific content item when they do not have permissions to open or edit any other items in the site or library. This level is automatically assigned by SharePoint when you provide access to one specific item. You cannot assign Limited Access permissions directly to a user or group yourself. Instead, when you assign edit or open permissions to the single item, SharePoint automatically assigns Limited Access to other required locations, such as the site or library in which the single item is located. Edit and approve pages, list items, and documents. By default, the Approvers group has this permission. View pages, items, and documents. Any document that has a server-side file handler can be viewed in the browser but not downloaded. File types that do not have a server-side file handler (cannot be opened in the browser), such as video files, .pdf files, and .png files, can still be downloaded. Office 365 plans create a security group called "Everyone except external users" that contains every person you add into the Office 365 directory (except people who you add explicitly as External Users). This security group added to the Members group automatically, so that users in Office 365 can access and edit the SharePoint Online site. In addition, Office 365 plans create a security group called "Company Administrators", which contains Office 365 Admins (such as Global and Billing Admins). This security group is added to the Site Collection Administrators group. Permission levels work together with SharePoint groups. A SharePoint group is a set of users who all have the same permission level. The way this works is that you put related permissions together into a permission level. Then you assign that permission level to a SharePoint group. To learn more about SharePoint groups, see Understanding SharePoint groups. Full Control This level includes all available SharePoint permissions. Site permissions apply generally across a SharePoint site. The following table describes the permissions that apply to sites, and show the permission levels that use them. List permissions apply to content in lists and libraries. The following table describes the permissions that apply to lists and libraries, and show the permission levels that use them. Personal permissions apply to content that belongs to a single user. The following table describes the permissions that apply to personal views and web parts, and show the permission levels that use them. SharePoint permissions can depend on other SharePoint permissions. For example, you must be able to open an item to view it. In this way, View Items permission depends on Open permission. When you select a SharePoint permission that depends on another, SharePoint automatically selects the associated permission. Similarly, when you clear SharePoint permission, SharePoint automatically clears any SharePoint permission that depends on it. For example, when you clear View Items, SharePoint automatically clears Manage Lists (you can't manage a list if you can't view an item). The only SharePoint permission without a dependency is Open. All other SharePoint permissions depend on it. To test a custom permission level, you can just clear "Open". This automatically clears all other permissions. Limited-access user permission lockdown mode is a site collection feature that you can use to secure published sites. When lockdown mode is turned on, fine-grain permissions for the limited access permission level are reduced. The following table details the default permissions of the limited access permission level and the reduced permissions when the lockdown mode feature is turned on. Lockdown mode is on by default for all publishing sites, including if a legacy publishing site template was applied to the site collection. Lockdown mode is the recommended configuration if greater security on your sites is a requirement. If you disable the limited-access user permission lockdown mode site collection feature, users in the "limited access" permissions level (such as Anonymous Users) can gain access to certain areas of your site. Now that you have learned about permissions, inheritance, and permission levels, you may want to plan your strategy so that you can set guidelines for your users, minimize maintenance, and ensure compliance with your organization's data governance policies. For tips on planning your strategy, see Plan your permissions strategy.